The core of Fusion VCA is a Russian miniature pentode 1�24B with power consumption comparable to an LED. 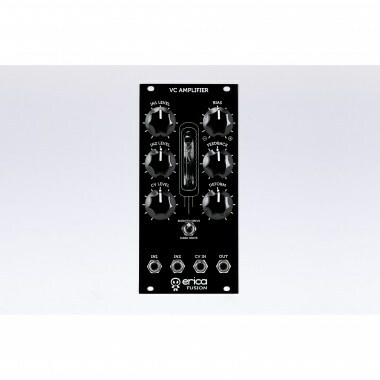 Eurorack модули Erica Synths Fusion VCA V2 Вы можете купить по выгодной цене в наших музыкальных магазинах в Москве и Санкт-Петербурге, интернет-магазин, доставка по России. We developed unique audio and tube control circuits so Fusion VCA sounds like nothing you�ve heard before. Feedback adds harmonics to the original signal and acts similar to cutoff knob on VCFs and Deform knob controls amount of distortion in germanium diodes based circuit. Due to the fact that the cold tube heaters have lower resistance, Fusion modules have significant power consumption peak at startup, when power consumption almost doubles for 1-2 seconds. This is not a problem with linear PSUs that have power inertia, but may cause switching PSU internal protection turn off the power supply. Please make sure your PSU has some headroom before installing multiple Fusion modules. 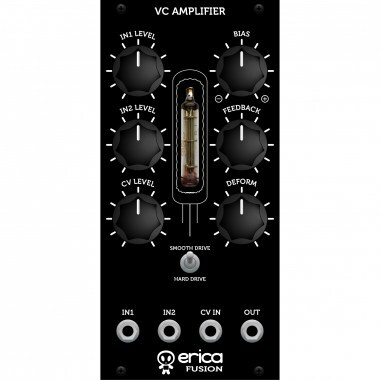 Erica Synths Fusion series modules are designed combining vacuum tubes and semiconductors therefore they bring warm, powerful sound and overdrive possibilities of vacuum tubes into your modular system. Erica Fusion series consist of range of modules used in sound shaping circuit � VCO, Mixer, real Ringmodulator using audio transformers and germanium diode ring, VCF, VCA and Analogue Delay/Flanger.